Have you seen those scooters around Salt Lake City? Riders seem to love them, but they’re giving the city headaches. 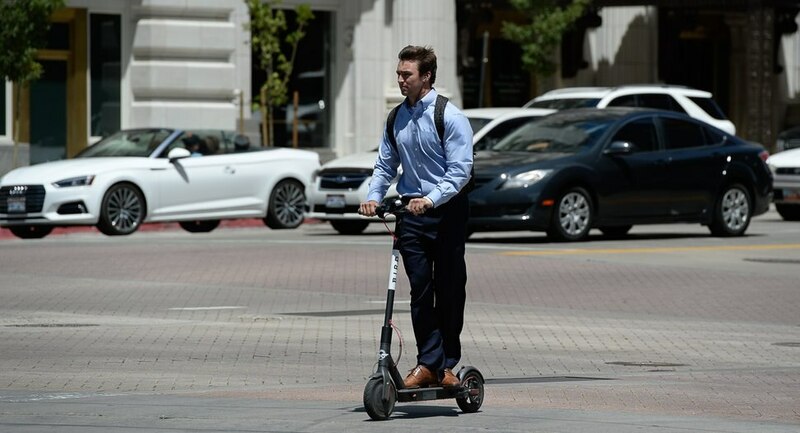 (Francisco Kjolseth | The Salt Lake Tribune) Scooting up South Temple, a rider of Bird, a dockless e-scooter designed to help people with the last mile of transit, takes advantage of one of the recently dropped scooters in downtown Salt Lake City on Tuesday, July 3, 2018. The city wasn't initially notified of the scooters' arrival in town, but is now working with the company to bring it into compliance with ordinances and regulations. A new dockless e-scooter company with a reputation for launching its vehicles first and complying with local regulations later has come to Salt Lake City true to that form. The city didn’t know Bird was dropping its vehicles on city streets until they came Thursday morning, said Jennifer McGrath, Salt Lake’s deputy director of community and neighborhoods. And the company is currently out of compliance with city business registration rules and perhaps with state law, she added. Since the business model is so new, McGrath said it makes sense that there would be some confusion. And to be fair, she added, a Bird representative said someone from the company had called the city a few weeks ago and thought they were doing things the right way. A representative from Bird told The Tribune no one was available for an interview on Tuesday. City officials met with representatives from the scooter business on Monday, and the company submitted a business license application that day. Now, Salt Lake is working on drafting a temporary operating agreement for Bird and similar businesses to operate under by July 10. In the meantime, Bird has agreed to suspend operations until it has a license, according to city spokesman Matthew Rojas. “We are really working quickly to try to make sure we can get [Bird] or anyone else out on the street in compliance as quickly as possible while we also work on kind of a long-term strategy,” McGrath said. That strategy will require a change to city code through an ordinance regulating the scooters. While still in the early stages, McGrath said, it may include an encroachment agreement to manage the devices on the public right of way and a cap on the number of vehicles companies can place on the streets. That won’t resolve possible issues with state law, though, which currently prohibits scooter use on roads with posted speed limits higher than 25 mph or more than four lanes — descriptors that may apply to many of the Salt Lake streets where the scooters are being used, Rojas said. (Francisco Kjolseth | The Salt Lake Tribune) Jenna Dellorusso, left, and Cassandra Better scoot along on a pair of scooters called Bird, a dockless e-scooter company that aims to help people with the last mile of transit, along Main street in Salt Lake City on Tuesday, July 3, 2018. The company recently dropped about 100 scooters downtown. Bird users must be 18 or older with a valid driver license and must bring their own helmets, if they want one. To take one of the scooters, a rider can simply download the company’s app to locate and unlock the most convenient one. It costs $1 initially to rent, plus 15 cents a minute. The idea and its goals are similar to Salt Lake City’s bike-share program. But unlike with GREENbike, there are no docking stations — meaning riders can simply drop the vehicle wherever their journey ends. On their way to work at Whiskey Street on Tuesday afternoon, Cassandra Betar and Jenna DelloRusso lit up with excitement as they snagged two scooters off the street to finish their commute. Betar said she’s ridden the scooters, which are calibrated to go a maximum of 15 mph, at least five or six times since they dropped last Thursday and prefers the ease of use and convenience in finding one compared to other transit options. “It’s the best thing,” DelloRusso agreed. Winston Guillory, a summer intern at Goldman Sachs, is originally from Texas and doesn’t have a car in Salt Lake. He usually takes TRAX to and from work but became curious about the scooter phenomenon last week. Since then, he’s adapted quickly, riding the scooters at least a half dozen times. “This is a more fun way to get around” than TRAX, he added. (Francisco Kjolseth | The Salt Lake Tribune) Winston Guillory, user of Bird, a dockless e-scooter company that aims to help people with the last mile of transit, scoots along South Temple on one of the recently dropped scooters in downtown Salt Lake City on Tuesday, July 3, 2018. Led by a former Uber and Lyft executive, Bird aims to bridge the gap in a person’s last mile of transportation and to “reduce car trips — especially the roughly 40 percent of trips under two miles — thereby reducing traffic, congestion, and greenhouse gas emissions,” according to a pledge on its website. GREENbike had been looking at rolling out its own fleet of e-scooters, said Ben Bolte, the nonprofit’s founder and executive director, but wanted to convene a group of stakeholders to receive input on the idea before deploying them. And until Bird sees more consequences for failure to comply with local regulations, Bolte said he thinks the company will continue to drop scooters first and listen to residents and city officials later. Bolte said he’s also concerned Bird’s operation may actually generate more car trips than it saves, since the company pays “chargers” per scooter to drive their personal vehicles around looking for scooters to pick up, plug in and place back on the streets in the morning. Bird has promised to give $1 per scooter per day to city governments for using roads and bike lanes, and to promote public safety. But its launch approach hasn’t exactly promoted good will among city leaders across the country. 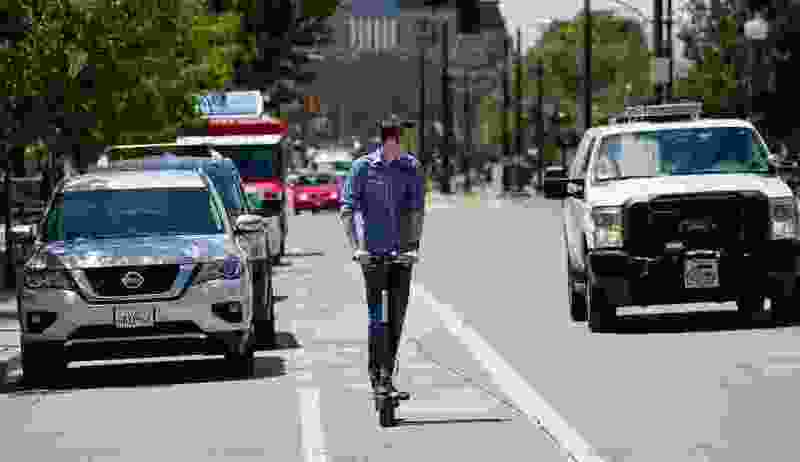 Officials in Nashville, Tenn.; Scottsdale, Ariz.; Miami; San Francisco and other cities sent Bird cease-and-desist letters shortly after the scooters dropped in their jurisdictions — but McGrath said she’s hoping Bird’s relationship with Salt Lake City won’t come to that.